Thank you for joining our farm. As a shareholder, remember that you now have a farm. Weather is happening on your farm, work is taking place on your farm, crops are growing, bees are buzzing, birds are singing on your farm. You are a part of Angelic Organics, a Community Supported Agriculture Farm. You are part of the extraordinary, sacred process of growing food, from planning to production to harvest to your table. Our ongoing commitment to you: we strive for diversity, abundance and quality in every box. We seed and transplant crops so they will start coming in the first week of harvest, too little and your box isn’t full; too much and we can’t find room for it in your box. Excessive heat will cause spinach to yellow and broccoli to bolt before the first harvest, excessive cold and…well, this season, the beets were not ready for the first box. But other things made up for the absence of beets, and we’re happy that your first box will be brimming with vegetables. Your box is an image of what has happened on the farm so far this spring. Savor the Spring. You can’t eat more seasonally than this. Cool, moist…a typical spring. Do we have typical springs, really? Ever since I can remember, my family and our neighbors talked about each season as though there had never been another one like it. It was always warmer, colder, wetter, hotter, drier, windier than any of the others. So, this spring was typical in that it seemed different from all the rest of the 55 springs I’ve been farming…sort of. Another perspective: if we get the crops in on time, it’s a good spring; if we don’t, it’s a bad spring. According to this rating standard, it’s been many years since we’ve had a bad spring. with our irrigation system, we now make our own rainbows. There’s a bewildering amount of work to do on our farm. Seeding, transplanting, tillage, weeding, trellising, building, machinery maintenance, fertility harvest, post-harvest, training, record keeping, distribution, marketing, researching, fencing, beautifying, errands, irrigating, etc. Some days we might have 5 tractors going and 20 people in the fields doing hand work. Managing our diversity of 40 crops is a bit like a liberal arts education where we’re always shifting gears, as opposed to a PH.D program, which would be very focused, more like mono-cropping. The farm re-uses the vegetable boxes. Flaps are easily torn when the boxes are dismantled improperly, and then the box bottom might later burst open with fresh, organic local produce heading towards the floor. On your next pickup please return your empty, flattened vegetable boxes to your delivery site. 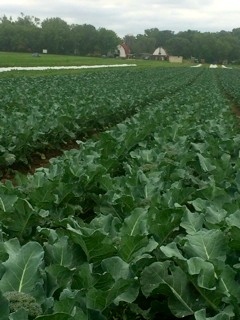 Keep your calendar open for our farm open house on Saturday, July 19 and Saturday, Sept 20. Kids love seeing their farm, and so do their parents. More details soon. Join us for a farm campout especially for women, including yoga, meditation, preparing farm-fresh meals, and more. Bring your own tent and gear. It’s happening on 11am on Saturday, June 21 to 12pm on Sunday, June 22.